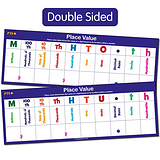 This double sided dry-wipe card helps pupils to get to grips with numbers. 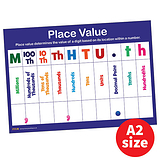 By clearly showing place values from hundredths all the way up to millions, the card assists learners in understanding this key aspect of numeracy. It has hundreds, tens and units on one side and hundreds, tens and ones on the reverse so can fit in with the way that you teach.